Long-time Republican political trickster and Donald Trump advisor Roger Stone's gig as the keynote speaker at Los Angeles and Boston marijuana expos has been canceled after news of his participation roiled the cannabis community. The Cannabis World Congress and Business Exposition (CWCBExpo) had selected the white-haired provocateur to address the two marijuana business conferences after Stone came out for legalization early this summer. But Stone's pro-legalization stance wasn't enough to protect him from charges of racism, misogyny, and being too close to Trump, who rode his own racist dog whistles to the White House. Once the announcement of Stone's participation was made, numerous speakers and exhibitors announced a boycott of CWCBExpo  led by the Minority Cannabis Business Alliance, whose members loudly withdrew from the conference . By last Wednesday, CWCBExpo had had enough of the controversy. "Following collaborative discussions with numerous partners, participants and interested parties who support the legalization of cannabis in an inclusive manner, Cannabis World Congress & Business Expositions, (CWCBExpo) is announcing that Roger Stone will no longer be featured as a keynote speaker at the upcoming CWCBExpo events in Los Angeles and Boston," the organizers announced in a news release. Stone's presence would work counter to the expo's goals, they said. The conference's forums "are crucial to the growth and legalization of the cannabis industry and they supersede the distractions that have surrounded the events," the release said. Stone, of course, wasn't taking the snub lying down. He told the LA Weekly he would sue CWCBExpo . "Sad day for the First Amendment," Mr. Stone told the newspaper. "The expo is in breach of contract. I will be suing them for $1 million. I will not be deterred from my efforts to persuade the president to preserve access to legal medicinal marijuana consistent with his pledge to the American people." 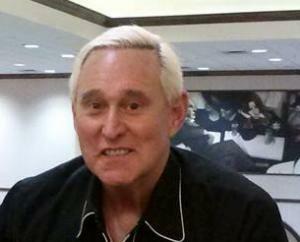 Don't be too worried about the prankster, though: Stone already has another gig lined up . He just started a new internet and radio program on InfoWars, home of Trump supporter and far-right conspiracy theorist Alex Jones.